In the past few weeks, members of the School of Law at Middlesex University have addressed committees of the EU Parliament to share the results of their respective research. First, Dr Erica Howard presented her study on ‘Implementation of the Employment Equality Directive: The Principle of Non-Discrimination on the Basis of Religion or Belief’ at a meeting of the Committee on Employment and Social Affairs of the European Parliament in Brussels. The study was commissioned by the European Parliamentary Research Service and was used to inform a report of the Committee on the Directive, drawn up by Ms Renate Weber, MEP for Romania and a lawyer and human rights activist, who acted as parliamentary rapporteur in this case. 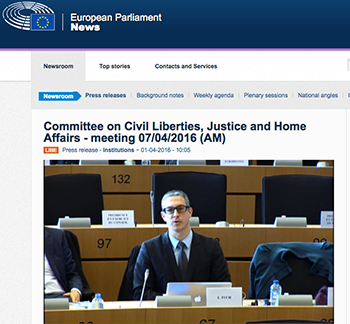 Later, Professor Laurent Pech (pictured), Head of the Law and Politics Department, spoke before the Committee on Civil Liberties, Justice and Home Affairs of the EU Parliament. His oral intervention focused on the report he co-authored on ‘The Establishment of an EU Mechanism on Democracy, Rule of Law and Fundamental Rights', which was published on 13 April 2016. The primary aim of this report was to identify the policy options available to the EU to address the current shortcomings and gaps in the existing legal and policy framework on democracy, the rule of law and fundamental rights.